Noghondarian, K., Mohammadi, E., Shahrabi Farahani, A. (2017). Comparison of autoregressive integrated moving average (ARIMA) model and adaptive neuro-fuzzy inference system (ANFIS) model. 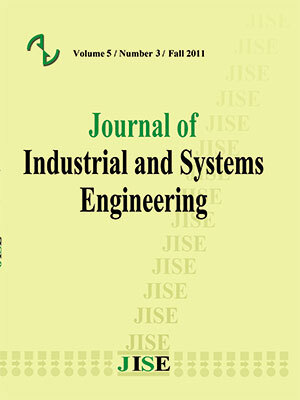 Journal of Industrial and Systems Engineering, 10(4), 96-109. Kazem Noghondarian; Emran Mohammadi; Ali Shahrabi Farahani. "Comparison of autoregressive integrated moving average (ARIMA) model and adaptive neuro-fuzzy inference system (ANFIS) model". Journal of Industrial and Systems Engineering, 10, 4, 2017, 96-109. Noghondarian, K., Mohammadi, E., Shahrabi Farahani, A. (2017). 'Comparison of autoregressive integrated moving average (ARIMA) model and adaptive neuro-fuzzy inference system (ANFIS) model', Journal of Industrial and Systems Engineering, 10(4), pp. 96-109. Noghondarian, K., Mohammadi, E., Shahrabi Farahani, A. Comparison of autoregressive integrated moving average (ARIMA) model and adaptive neuro-fuzzy inference system (ANFIS) model. Journal of Industrial and Systems Engineering, 2017; 10(4): 96-109. Proper models for prediction of time series data can be an advantage in making important decisions. In this study, we tried with the comparison between one of the most useful classic models of economic evaluation, auto-regressive integrated moving average model and one of the most useful artificial intelligence models, adaptive neuro-fuzzy inference system (ANFIS), investigate modeling procedure of these methods. Furthermore, we analyzed the performance of these methods in prediction the global gold price. For this purpose, 200 gold price data from February 2015 to October 2015 were gathered. We used both methods for determination of model parameters then we predicted the test data. With respect to reliable standards of evaluation prediction as root mean square of errors, it was seen that in time series data, prediction of adaptive neuro-fuzzy inference system model is more accurate than the auto-regressive integrated moving average model. So we can conclude that at least in some cases where time series have a non-linear trend, it is better to use adaptive neuro-fuzzy inference system model for prediction. In this manner, we can reach our goals in future with higher accuracy in our decisions, in future. ejlal,R: translation of neural networks, number 1. Zera-nezhad, M.,Hamid,Sh. (1388). Inflation rate Prediction of iran economy by using artificial time dynamic neural networks (time series point of view), quantitative economic journal ,6:1. Sarfaraz,L. (1384). investigation of Effective factors on gold price and offering prediction model based on neural networks, economical researches journal,16. Abbasi-nezhad, H., (1384). advanced econometric. University of Tehran. Mohammadi, H., Abdi-zadeh, Sh.. (1392). advanced econometric by Eveiws (theory and application), nashre-elm publication, Tehran. Niroomand, H.,(1376). time series analysis: single and multi-variable method. University of Ferdowsi mashhad publication. Yaghoubi, M., (1386). Presentation of a novel fuzzy time series for prediction of Fluctuations in the price of the currency. Iran computer community. Akaike,H.Fitting autoregressive models for prediction.Ann.Inst.Statist.Math.(1969).21,407-419. Li_Xin Wang, A Course In Fuzzy Systems and Control, Prentice Hall PTR, pp. 192 205, 1997. Nikola K.Kasabov, Qun Song, ” DENFIS: Dynamic Evolving Neural-Fuzzy Inference System and Its Application for Time Series Prediction” IEEE Trans. On Fuzzy Systems, Vol. 10, No. 2, pp. 144-154, 2002, pp.